I come from a background in computational chemistry and so was particularly delighted at this year’s recipients of the Nobel Prize in Chemistry; namely Martin Karplus, Michael Levitt and Arieh Warshel for, “the development of multiscale models for complex chemical systems”. The realm of theoretical computational chemistry is often regarded as a dark and daunting forest; capable of scaring off chemists and computer scientists alike with its blend of the two disciplines. Hopefully, by the end of this essay, I will have been able to demonstrate, in an intuitive way, why this work was significant and can impact our world. The methods developed by the aforementioned Laureates allow modern day scientists to ‘play’ with atoms (e.g. Helium), small molecules (e.g. water) and more complex biological structures (e.g. the DNA of our own genetic code) in ways that are impossible (for now) to recreate in real-life experiments. The ability to conduct these single molecule experiments has allowed us to begin designing systems to explore and manipulate our world at never-before-seen scales. From exploring the way drug molecules interact with their targets to how spider silk’s fibres confer the ability to stop a bullet; we are capable of explaining biological phenomena better than ever. I would like to begin the introduction of the basics of these methods by considering a ball-and-stick model, something which can be used to describe any molecular structure from a single methane molecule, containing only 4 atoms, to a giant viral capsid made of millions of atoms. 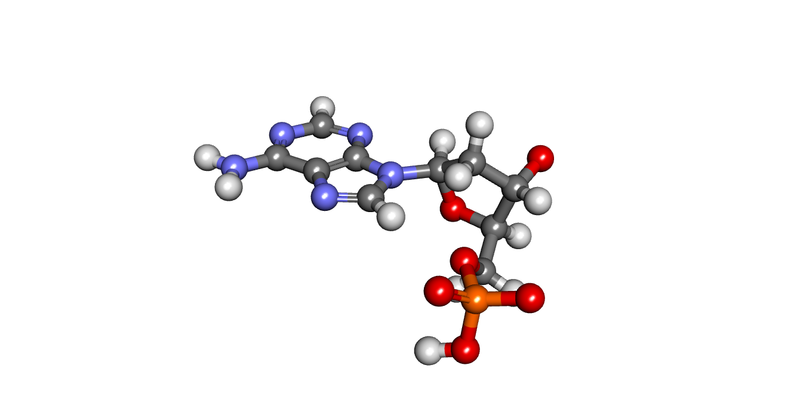 We will explore the behaviour of this ball-and-stick model (illustrated in Figure 1) of our molecule of interest using the method of molecular dynamics (MD), which was designed to study how molecules (molecular) move (dynamic). This method will allow us to determine the shapes our molecule will most likely adopt in real life, either if left to its own devices or if we directly interfere with it, e.g. through stretching it. The method describes a chemical system as sets of charged spheres (the balls in our ball-and-stick model) connected by springs (the sticks in our ball-and-stick model). For a given conformational state of the system, i.e. the relative locations of the spheres to one another at a specific time, the total energy can be defined in terms of the relative positions of the particles and how fast they are moving. These energy calculations allow the force acting on each particle to be calculated and Newton’s equations of motion (used to describe the motions of real-life objects) are then integrated in time to produce movement of the particles in three-dimensional space. This process creates, in effect, single molecule experiments that we can simulate on a computer (or, as scientists say, “in silico”). Figure 1, A ball and stick model of a single DNA base: Here we have a ball-and-stick model of the simplest part of our own DNA genome, a single base (in this case adenine) with part of the helix backbone. The different coloured spheres represent different atom types: carbon (grey), hydrogen (white), nitrogen (blue), oxygen (red) and phosphate (orange). The tubes connecting them represent the inter-atomic bonds which are treated as springs in a molecular dynamics simulation. In some places you can see two tubes connecting atoms – these are double bonds, basically two springs connecting the atoms together. The steps in designing these experiments are: (i) choosing the type and number of molecules that you would like to simulate, (ii) placing them in a container (usually a square box) of a certain size, (iii) deciding how they interact with each other, i.e. how powerfully they bounce off one another; and (iv) setting the temperature which will determine how fast they will all be moving. The energy values we measure during the simulation allow us to elucidate when our molecule will be in a certain configuration as molecules will generally attempt to adopt the configuration of lowest energy if left to themselves. One of our universal laws is that a system, of one or many molecules, will try and obtain the lowest possible “free energy”. This free energy is the combination of the bonds holding a molecule together (the “enthalpy” of the bonds reduces the energy) and the level of disorder (the “entropy” from the disorder reduces the energy) where the system wants to be as disordered as possible. An example of this is when ice will melt at room temperature to form a liquid and eventually a gas; the process is entropy-driven. The total energy is thus a continual struggle between the strengths of the bonds holding the molecules together and the desire of the system to break apart into a disordered state. Importantly, the entropy component is dependent on ambient temperature and reaction free energies can be complex, requiring their own branch of study. Until recently, the explicit behaviour of dynamic chemical systems, where all the atoms for both solvent (the component in larger quantity, e.g. the water in seawater) and solute (the component in lesser quantity, e.g. the salt in seawater) are present, was restricted to small molecules. For every atom added to a molecule the number of calculations the computer had to perform increased greatly. In the early days of chemical computation the behaviour of large molecular systems had to be performed using implicit simplifications of their structure and the interactions of their components (a common approach was to treat the solvent implicitly and the solute, the molecule of interest, was treated explicitly). This made their evaluation times tractable . The development of modern algorithmic techniques to reduce the number of required calculations (many of them by the researchers mentioned in the introductory paragraph), in tandem with the extraordinary recent advances in computer hardware, has provided researchers for the first time with the techniques to begin interrogating the detailed world of biological-sized systems, accounting for all their features. I will now introduce a class of advanced molecular dynamics methods, illustrated through applications in my own work, which permit unprecedented insight into the complex confluence of chemistry, physics and biology. These methods allow us to describe the behaviour of complex molecules, with many movable parts, in terms of simple measurements, e.g. the distance between the ends of the molecule as it is being stretched. Systems at the biological scale contain an enormous number of atoms and we are often only interested in the relative behaviour of large groups of atoms, e.g. the distance between the terminal amino acids in a peptide chain folding or unfolding. To simplify our system we make a ball-and-stick model of our ball-and-stick model, turning the larger model into a simpler one that contains at most a handful of balls and sticks. Now the balls represent groups of atoms. The sticks are no longer interatomic bonds but rather simple connections between these clumps of atoms. It is then possible to calculate both physical, e.g. bending stiffness or specific heat capacity, and free energy, e.g. enthalpy or entropy, quantities for these molecules. I must add that although we are measuring the energy in terms of a simple measurement, we are still accounting for all the individual atoms and are conducting an explicit experiment. Considering examples from my own studies on DNA duplexes, to illustrate how certain methods can exploit these variables, we can gain insight into the processes occurring at the molecular scale. DNA duplexes are short pieces of a DNA double helix, as if we had clipped off a tiny part of our genetic code and were looking at it up close. My research involves stress-testing DNA duplex “beams” for the development of nano-architectures, basically the minuscule equivalent of checking construction beams before they are used at a building site. In the case of a real-life building site, however, we can consider the beam as a single element that has very well understood behaviour, i.e. it is rigid, does not stretch and we understand how it bends. When building with DNA on length scales smaller than the size of our cells, elucidating the mechanical properties of these “beams” is a challenging task as we are no longer working with a single object but rather our ball-and stick model which has many moving parts. We are working with these structures in a liquid, which is the same as trying to build a house underwater. We are essentially building a house out of sticks and balls, underwater, where the water currents are strong enough to knock the house down. To successfully achieve this challenging task we need to understand very well how the different building blocks behave. Trying to understand how these blocks behave is similar to investigating a stretched elastic band, which would rather be shorter than longer. When looking at DNA under the effects of stretching, bending and twisting the configurations I am interested in are far from those which the DNA normally adopts. In order to explore these rare configurations I use a class of advanced MD algorithms which help me overcome the high energy barriers which need to be crossed so as to reach them. These algorithms act as molecular “hands” which can then pull on, twist or bend the molecules as if I was doing it myself. By doing this I can see how different types of DNA will respond when they are put under stress, particularly important when I want to build small structures out of them. The figure below shows two pieces of DNA that only differ by having a break in their backbones, as if there was a missing tooth on one side of a zipper. When I stretch them they behave very differently and I need to be careful which type I will use when designing small DNA devices, i.e. 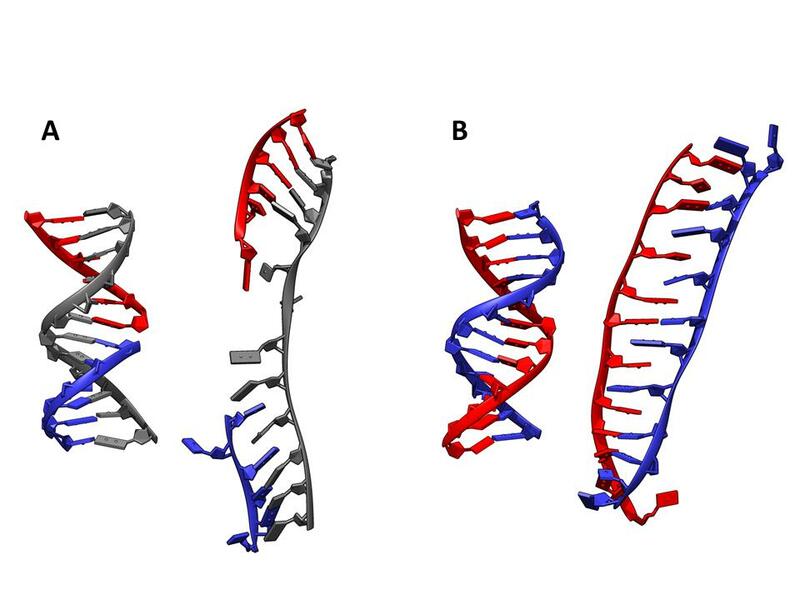 I would choose the type of DNA in Figure 2B if I wanted a structure to withstand stretching well. Figure 2, How different types of DNA respond to being stretched: (A) The DNA strand with a break in its backbone splits into two separate parts. (B) The strand without a break, while changing its shape somewhat, remains together and will not split apart. It can immediately be seen that the two systems exhibit very different behaviours under a stretching force, the intact duplex forms a ladder-like configuration, while the broken duplex separates into two distinct domains which can then rotate and move freely. While this is a fairly simple example, it demonstrates the real power of these methods; that they can be used to explore atomic systems as if one were directly acting on them. What we now have at our disposal is a way of taking models of molecules that we are interested in and manipulating them as if we were holding them in our hands. From these experiments we can help build simple but effective models to describe behaviours of larger systems, hopefully allowing us to explain biological phenomena and to design ways to directly interact with our world at the molecular level. Major applications of these methods have included the elucidation of how drug molecules interact with cancer targets, how ions pass through the linings of our cells and facilitate the transport of nutrients, how energy transfer occurs in mitochondria (the powerhouse of our cells). When one also accounts for the behaviour of individual electrons in these methods it is possible to simulate the forming and breaking of interatomic bonds, explaining how certain molecules can be formed… though that is a story for another time. In my own research I am using these methods to better design DNA structures which can then be used to build artificial energy harnessing devices (biological solar cells) and tiny enzyme bioreactors (a brewery that can fit in your pocket). The addition of these methods to science and engineering’s arsenal of investigative methods should allow us to more effectively probe biological systems and to design real-world experiments to test our hypotheses; thereby pushing research to an even higher level of precision. Matthew Adendorff is a 2010 fellow of the Fulbright Science & Technology Award, from South Africa, and a PhD Candidate in Biological Engineering at the Massachusetts Institute of Technology.